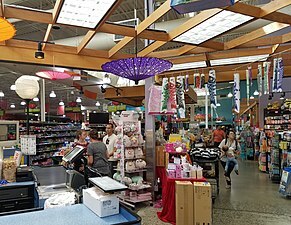 Uwajimaya, Inc., doing business as Uwajimaya Asian Grocery & Gift Markets (宇和島屋, Uwajimaya), is a family-owned supermarket chain with its corporate headquarters in the Industrial District, Seattle, Washington, and with locations in Greater Seattle and Oregon. Uwajimaya sells mainly Asian food—with an emphasis on Japanese—though it also stocks Western staples. The flagship store is in Seattle's Chinatown/International District with three other stores in Beaverton, Oregon, Bellevue, Washington and Renton, Washington. From 1968 to 1991 there was another store in the Southcenter Mall in Tukwila, Washington. Uwajimaya was founded in 1928 by Fujimatsu Moriguchi of Yawatahama, Japan, in Tacoma, Washington. Fujimatsu sold fishcakes and other goods from his truck to Japanese farmers, loggers and fishermen at work sites. Moriguchi named his company Uwajima-ya after the town of Uwajima (Ehime Prefecture), where he first entered the business (ya (屋) is the Japanese word for "store"). As part of the internment of Japanese Americans following the entry of the United States into World War II, Moriguchi and his family were sent to the Tule Lake Internment Camp in 1942. Upon their release, they moved to Seattle and set up shop at 422 S. Main Street in the International District. In the 1960s Uwajimaya began to expand its offering of non-food items and imported food from Japan and other Asian countries and experienced tremendous growth at the Century 21 Exposition In 1962. That same year, Fujimatsu Moriguchi died, and breaking with Japanese tradition, control of the company was passed to his four sons, rather than only his eldest son. In 1970, the store moved two blocks south to 6th Avenue S. and S. King Street, thus becoming one of the biggest in the Pacific Northwest, and expanded in 1978 adding more than half again its original size. 1978 also saw the opening of the Bellevue Uwajimaya. 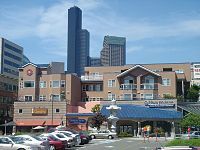 In 1991, Tokyo-based Kinokuniya Bookstore opened its first Seattle location on the second floor of the Seattle store selling primarily Japanese language books, movies, DVD, videos, music, and periodicals. In 1998 Uwajimaya, with Lorig Associates, started developing Uwajimaya Village, a mixed retail, residential center that would take up three city blocks including the purchase and closure of S. Lane Street between 5th and 6th Avenues South. The Lane Street closure was controversial within the community, especially among some local small-business owners who were concerned that it would increase traffic, decrease emergency vehicle access, and have a negative economic impact on other businesses. The International District saw a protest of over 500 strong, the biggest street protests since the Kingdome was built. Save Lane Street, a group formed to stop the street closure, collected over $140,000 and 4,000 signatures and sued both the city of Seattle and Uwajimaya. The group lost their case, eventually appealing to the King County Superior Court and then the state Court of Appeals. In the end S. Lane Street was vacated to allow Uwajimaya to provide a pedestrian walkway to customer parking to the South. In 1998 Uwajimaya opened its third store, the first outside Washington located in Oregon near the Beaverton high-tech corridor. Upon completion of the Uwajimaya Village project in 2000, the flagship store moved one block south to a building twice the size of the previous store. Uwajimaya Village includes a food court, bank, restaurant, optician, beauty salon, cellular wireless store, and cosmetic shop. The Kinokuniya Bookstore also relocated to a new location at the corner of 5th Avenue S. and S. Weller Street. Above the first floor of retail shops and underground parking garage is the 176-unit Uwajimaya Village Apartments. Sadako (Tsutakawa) Moriguchi, wife of Fujimatsu and sister of George Tsutakawa, died in 2002. In 2008, Uwajimaya anchored a redevelopment proposal, similar to the Uwajimaya Village, for Portland's Old Town/Chinatown. Uwajimaya opened a new location in Renton, Washington on July 1, 2009. In August 2016, Uwajimaya announced its intention to launch a line of smaller, boutique stores known as "Kai Market by Uwajimaya", with the first location in Seattle's South Lake Union neighborhood. ^ "Uwajimaya Is Searching For A New Bag Design! Archived 2012-04-15 at the Wayback Machine" Uwajimaya. Retrieved on November 13, 2011. "Uwajimaya Corporate Office 4601 6th Avenue S., Seattle, WA 98108"
^ a b Davila, Florangela (2000-11-30). "Uwajimaya celebrates its 'dream' store". Seattle Union Record. Archived from the original on 2005-03-26. Retrieved 2006-09-13. ^ "Company History of Uwajimaya". Uwajimaya, Inc. Archived from the original on 2006-07-15. Retrieved 2006-09-13. ^ a b Tice, Carol (2002-04-14). "Cash registers ring at Uwajimaya's new grocery store". Puget Sound Business Journal. Retrieved 2006-09-13. ^ Mulady, Kathy (2001-07-09). "Historic Uwajimaya anchors the International District". Seattle Post-Intelligencer. Retrieved 2006-09-13. ^ Jacklet, Ben (1999-06-15). "The Great Mall of Chinatown". The Stranger. Retrieved 2006-09-13. ^ Germain, Shanna (2003-07-04). "Asian Tiger". Portland Tribune. Archived from the original on 2003-11-22. Retrieved 2006-09-13. ^ Moriwaki, Lee (December 9, 2000). "The flavor is Asian: New Uwajimaya store is open". The Seattle Times. p. C5. ^ Korn, Peter (2008-07-09). "Merchants look to Uwajimaya for Old Town/Chinatown boost". Portland Tribune. Retrieved 2008-07-09. ^ "Uwajimaya Locations". Uwajimaya official website. Archived from the original on 2009-04-20. Retrieved 2009-04-22. ^ Garnick, Coral (August 30, 2016). "Uwajimaya is expanding with a new boutique market concept". Puget Sound Business Journal. Retrieved August 30, 2016. Wikimedia Commons has media related to Uwajimaya. Chiu, Iisa. "Chinatown International District: Dim sum and then some." Seattle Times. November 24, 2005. Modified on November 25, 2005. Ramirez, Marc. "Uwajimaya celebrates its 80th anniversary." Seattle Times. October 8, 2008.